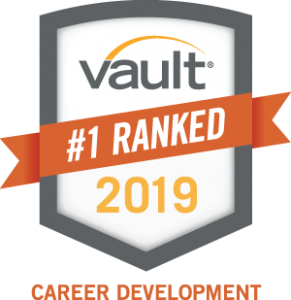 The results are in and Vault.com has ranked College Works as the #1 Internship for Career Development. Vaults main mission is to provide the intelligence that students and professionals need to build the careers they want, and to partner with companies seeking to engage with people pursuing high-potential careers. We are ranked among internships at Schwab, Capitol One, Nickelodeon, Northwestern Mutual, and IHeartMedia. Read the full list HERE. Check out our full Vault Profile Page HERE. The Career Development Category is based on: training and mentoring, quality of assignments, real-life experience and networking opportunities. Our interns don’t just make copies and poor coffee, that’s why our interns consistently get great jobs when they graduate, and our alumni network opens doors for them at hundreds of companies. Click HERE to download our full Vault Flier with more reviews, the hiring process/sample interview questions, and day-to-day responsibilities straight from our interns. We are beyond excited for this ranking! A big THANK YOU to our interns and alumni. Our program wouldn’t be what it is without the path that our super successful alumni have carved for current students to follow in their footsteps.